Top Line: Hilco Vision is a one-stop shop for the in-office lab, offering everything from dyes and adjustment colors to Rx trays. The company also has strong market positions in professional and consumer eyewear accessories; protective eyewear—Rx sun, Rx sports and Rx industrial safety; and eyecare products. Top Line: For more than 40 years, Santinelli International has advocated that ECPs need a top-performing in-office finishing lab in order to succeed long-term. Their ongoing commitment to quality, innovative technology, technical expertise and unmatched customer service, have earned them a leadership position to be proud of. Top Line: Hilco Vision's extensive product range—more than 20,000 products—includes a large selection of bench tools. The product range includes pliers, screwdrivers, wrenches, drills/taps, tweezers and files. The company also offers fashion eyewear, low vision products and lens cleaning products. Hilco Vision's focus on innovation, service, and value have strengthened its market position. Top Line: For eight years in a row, Eyefinity has been voted favorite practice management software—thanks to its customers. The feedback and insights provided by customers are what have enabled Eyefinity to deliver leading practice management/EHR software that help streamline everyday complexities and increase revenue. With cloud (Eyefinity Practice Management and AcuityLogic) and server-based (OfficeMate) solutions, Eyefinity has a practice management solution for all practices. Top Line: Used in more than one-third of computerized eyecare practices to automate everyday tasks, OfficeMate, an Eyefinity on-premises practice management solution, is the leading solution in the optical industry. OfficeMate satisfies all practice management needs by maintaining and managing patient demographic information that is easily entered and accessed. Top Line: Eyefinity is the industry leader in EHR and practice management software—thanks to the feedback and insights provided by customers. Its customer-driven enhancements ensure its EHR and practice management solutions streamline everyday complexities and increase revenue. With cloud (Eyefinity EHR) and server-based (ExamWRITER) solutions, Eyefinity has an EHR solution for all practices. Top Line: ExamWRITER, an Eyefinity on-premises EHR solution, automates everyday tasks, reduces dependency on paper, and improves practice efficiency. With ExamWRITER, workflow is simplified by automatic documenting and updating of new exam records, built-in ICD-10 auto-coding, and drawing tools which enable users to include graphical images with relevant notes. Top Line: The Visioffice 2 System, a leader in digital dispensing technology, delivers an accurate, precise, and consistent way to fit practice’s ever-evolving patient needs. The Visioffice 2 System enhances the patient experience, helps build patient trust and confidence with quick, accurate measurements, and allows practices to dispense the latest, most advanced lens technologies. Top Line: Solutionreach is a software as a service (SaaS) company in the patient relationship management field. With a cloud-based platform, providers can cultivate and maintain connected relationships with patients throughout the continuum of care, making it easy to automatically deliver personalized communication. The solutions are designed not only to provide enhanced efficiency for the practice, but to do everything possible to ensure a positive outcome for the patient as well. Top Line: Solutionreach is a cloud-based patient engagement platform designed to increase revenue, decrease costs, and maximize office efficiency. With powerful tools that also help you acquire new patients, Solutionreach engages patients before, during, and after their appointments, creating and maintaining an active, loyal patient base. By delivering the right message, to the right patient, at the right time, Solutionreach helps providers make every patient feel like the only patient. Top Line: Solutionreach understands that demands on physicians and administrative staff rarely allow for the patient interaction that both sides want. That’s why they created what has become a leading patient relationship management platform. It all started with email and text appointment reminders. Now, after over 15 years and partnerships with more than 23,000 health care organizations, Solutionreach empowers providers with the tools they need to maximize patient relationships and foster loyalty. 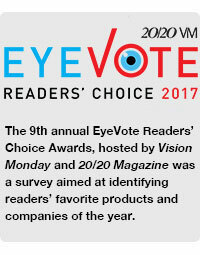 Top Line: VisionWeb is the industry’s leading provider of software and technology services designed to streamline and simplify the eyecare industry. Through the company’s online ophthalmic product ordering and electronic claim filing services, VisionWeb’s technology helps eyecare practices drive out inefficiency, increase customer satisfaction and improve their bottom line. Uprise, VisionWeb’s EHR/PM platform is a modern, cloud-based platform to streamline the patient experience from check-in to check-out.